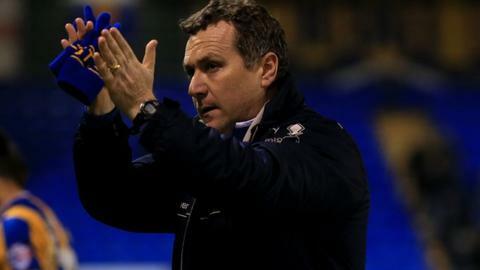 Shrewsbury Town manager Micky Mellon says the air of "negativity" from sections of their fans is giving no help in their quest to stay away from the wrong end of the League One table. Two successive 1-1 draws have done little to stem the current mood of frustration in Shropshire at Town's current 22nd place in the league. "There's a lot of frustration around. People want to win games," said Mellon. "But some stuff that's getting said could affect the players," he added. "I don't mind criticism coming my way. I deal with that. I'm disappointed with the way we've played and the amount of points we've got. "We should have taken more - we know that. But, when that negativity comes in, it doesn't do the players any favours." Mellon's 72nd-minute substitution of midfielder Shaun Whalley in the draw with Peterborough was Tuesday night's main flashpoint. Whalley was pinpointed by Mellon as being at fault for Peterborough's first-half goal, but the Town manager insists that he was brought off only because he was injured. "He's popped his calf," explained Mellon. "He's probably going to be out for a little bit of time. He felt it pop. "If he's done his calf, then he's done his calf. What does he have to do? Fall down and give a big signal that he's injured? "Maybe they should look at the detail and get right around the lads, instead of everybody jumping on everything that we do so quickly." "Micky Mellon has worked hard to forge a bond with Shrewsbury Town's supporters - celebrating with them after important wins and crediting them with helping the team's success, particularly in winning promotion 18 months ago. "His complaint about the "negativity" coming from the terraces feels like a watershed moment. Fans have long memories and the only thing that helps them forget is a winning team. "The manager hasn't lost support completely. While his team have been jeered loudly at the end of their last four home games in league and cup, a group of fans remain defiantly in his corner. But the criticism of him is mounting and he needs to find that winning team quickly to turn the tide."